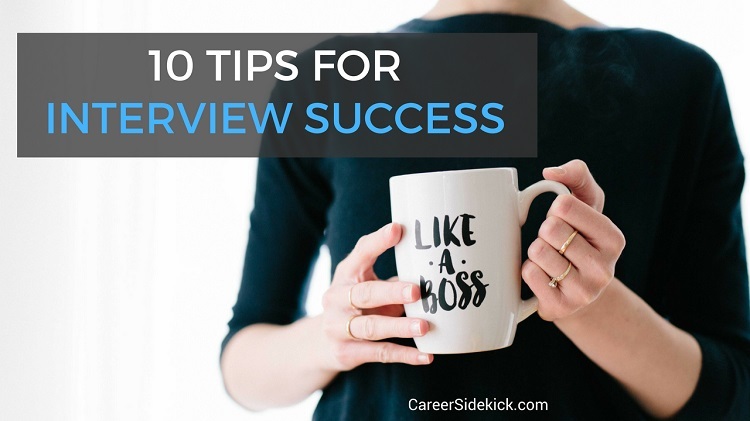 After working as a recruiter for most of my career, I’m going to share the top 10 tips for interview success that I picked up over the years. If I could only recommend 10 things to focus on before your interview, this would be it. Interviewers can tell when you’ve done your research, and they love seeing it. The start of the interview is your chance to make a great first impression. Walking in with zero knowledge of their business is one of the fastest ways to shoot yourself in the foot and NOT get hired. It could even lead to them ending the interview early. That’s one of the biggest signs your interview went badly, and you definitely want to avoid that (for example if you were told it would be a one-hour interview, and you finish in 25 minutes). Most people go into their interview and make general statements and talk in very general terms. To set yourself apart, you want to prepare specific examples and talk about DETAILS. Facts, numbers and real accomplishments. Hint: this is true on your resume also. You’ll get far more interviews if you cram your resume with facts, figures and statistics instead of general statements like “responsible for handling customer requests”. So when the hiring manager asks what you accomplished in your last job, or what you do each day, you should be ready to impress! This is not the time to hesitate or be unsure. Prepare ahead of time for this. If you’re looking for your first job without any work experience, then think about accomplishments in your academic career – classes you’ve taken, projects you’ve completed, etc. That’s your most relevant experience! If you seem like you are desperate or willing to take any job, you won’t get any good job offers. You need to seem like you’re looking for the right fit, not the first job offer you can get. This is a key part of interview success, and one of the most important tips I can give you. So, how do you do this? You walk in knowing specific things about the company and the job (study the job description), and be able to explain how it fits what you’re looking for in your current job search. Then the interview becomes about discussing whether the job is a good match for what you’re looking for. That’s the general idea. Most job seekers don’t realize this though, and go in thinking it’s an interrogation or a series of questions they need to “pass” or answer “correctly”. You don’t need to seem perfect in the interview to get hired. Don’t try. Be human. If you seem fake, or if you try too hard to give “perfect” answers, the hiring manager might not be able to get a real sense of what your strengths and weaknesses are. And if they can’t tell, they won’t hire you. So, don’t go in with interview answers you read from the top of Google. If you found those in 5 minutes, everyone else did too. Come up with great answers that are unique. Remember that it’s also okay to occasionally say, “I’m not sure”, or “Sorry, I’m drawing a total blank”. (This is okay once or twice per interview. If you find yourself doing it more, it’s a sign you didn’t prepare enough). Employers judge you heavily based on the questions you ask. Running out of questions before you’ve met everyone, or saying, “I don’t have any questions,” can cost you the job. Asking “bad” questions can cost you the job too. If you aren’t sure what to ask, here’s a master-list of the best questions to ask. And here are 5 great questions to ask recruiters in particular (this is for phone interviews or first conversations with any recruiter). This is often the difference between interview success and failure, so don’t neglect this part of preparing for your interview. When you hear someone’s name, repeat it to yourself in your head once or twice IMMEDIATELY after you shake hands. This helps you remember it. Most of the time, if you forget someone’s name, it’s because you never really “got” it. Immediately after you heard it, you forgot. So this is how to remember. Then, use it in the conversation within the first 5-10 minutes of the interview. Now you’ll never forget it. There’s another benefit to this too – using someone’s name helps you build a bond with them and build trust. Studies have shown you seem more confident, competent and impressive when you say someone’s name when talking to them. Go talk to the CEO in your company, and I bet they’ll use your name in the conversation. Leaders do this. Successful people do this. This is a very under-rated tip for interview success that anyone can do. It just takes effort. You will build a stronger bond/rapport with the interviewer if you do this, and they’ll be more likely to remember you favorably and hire you. Don’t use vague language and “dodge” their questions. And don’t lie. They’ll usually know. Hiring managers interview a lot of people and have a great sense for this. If you lie and get caught, there is no way they’re going to hire you. And if you seem like you’re trying to hide information, they won’t trust you and won’t hire you either. Hiring managers aren’t just evaluating your skill; they’re evaluating your character. If you’re going to be joining their team, they need to see what type of person you are. And no hiring manager wants someone who is dishonest on their team. What do they want? Someone who stands up and takes responsibility when things go wrong, who can learn from past mistakes, who is honest if there’s a problem, and who isn’t afraid to tell the truth. The interview is where they test this before hiring you. So just remember that while they’re judging your experience and skills, they’re also judging these character traits. Don’t badmouth former bosses, former employers, coworkers or anyone else. Here’s what happens when you do: The interviewer will immediately become curious about the other side of the story. They’ll wonder if you were part of the problem (or the whole problem). They’ll wonder if you’re someone who always looks to blame others. They’ll worry you have a bad attitude and won’t be able to fit into their organization. And they won’t hire you because of this. So never, ever badmouth anyone from your past in your interview. Also, you never know if the interviewer knows somebody who you’re bad mouthing! Many industries have pretty tight-knit communities. Here’s a little secret: The interview isn’t really about you. If you want to start getting a TON of job offers from your interviews, you need to start thinking about what the company wants. Make yourself seem like a solution to their problems. How can you help them make money, save money, save time, etc.? How will you make the hiring manager’s life easier if he or she hires you? Figure out how to show this, start thinking about their needs and answering their questions with this mindset and you will be in the top 10% of job seekers. Same goes for writing your resume. You want to stand out? Start thinking of your resume as being about THEM. It’s a document that should be “tailored” to the employer’s needs, showing them how your qualifications and past work will help you step into *their* job and be successful in their organization. That’s the general idea, and it’s true for resumes, cover letters, and interviews. When your interview is wrapping up, ask each person you met for a business card. This will help you follow-up and boost your chances of getting hired. One day after your interview, send “thank you” emails to each person you met, mentioning something specific you discussed with them and thanking them for their time. (You mention something specific so they know it’s not a cut & paste email). If you want a word-for-word template you can use, read this article. Also, at the end of your interview, ask the company when you can expect to hear feedback. Then… let’s say they told you it would take five business days. On the sixth business day, if you haven’t heard anything, you’ll want to send an email to follow up and check for feedback. Doing this will maximize the chance you get the job offer.